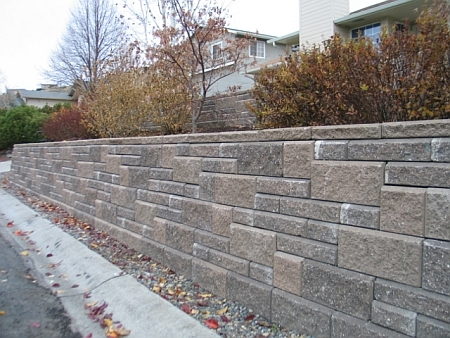 When Eastern Washington University decided to replace the failing railroad tie retaining walls around the PUB, they chose the Allan Block Retaining Wall System from White Block Company, Inc. 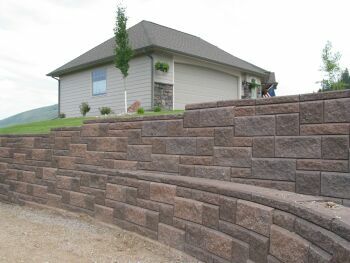 They used the Allan Block Ashlar Pattern in our Red Rocks Blend color. EWU sent a number of their employees to our Allan Block Contractor Certification Class to give them the knowledge and experience to build these walls. 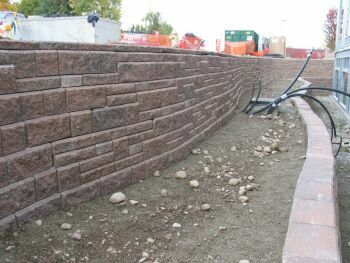 Their crew did a great job on this installation. 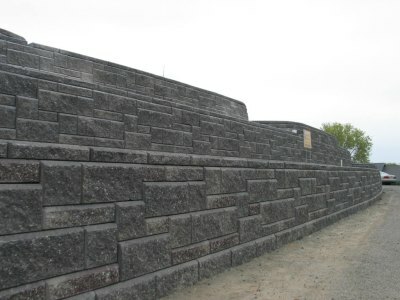 This is one of the first Allan Block Ashlar walls we provided material to. 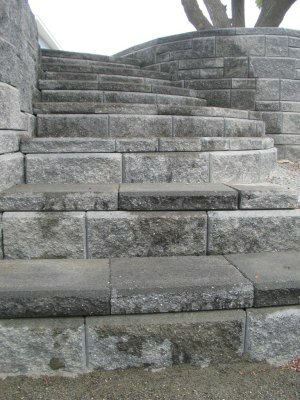 It has Steps, Terraces, Curves and Corners. 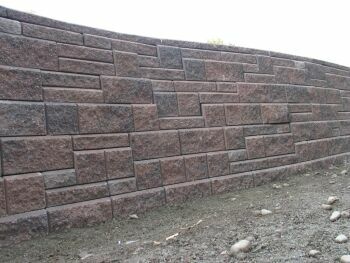 This was a difficult wall to build, especially using the Ashlar Pattern for the first time. 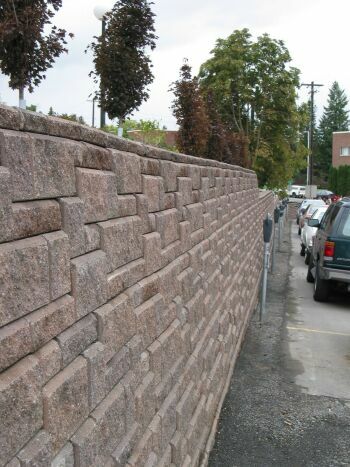 Interlok Systems' crew did a great job installing this wall. 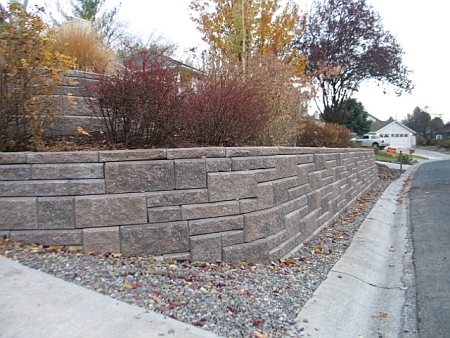 The color used is our Redrock Blend. 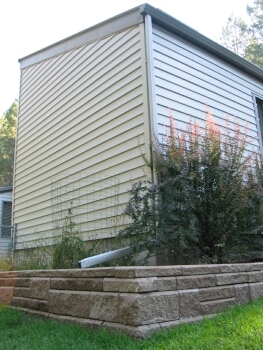 These walls were built to provide usable space at the property line. 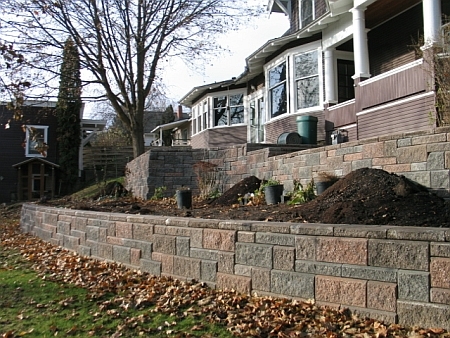 The ashlar wall splits off into a terraced wall to create a planter area in the front yard. 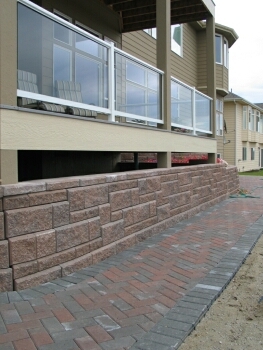 This was the first ashlar wall that Hard Rock Stone Company installed. 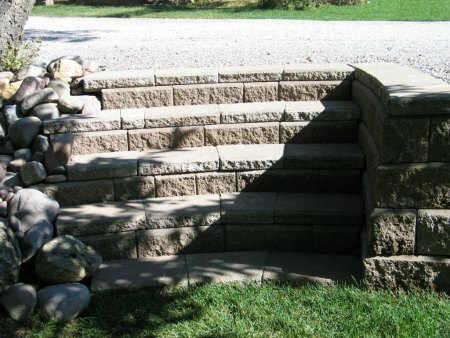 John was waitng for the right project to try the Ashlar pattern. The homeowner chose our Shadow Blend color. 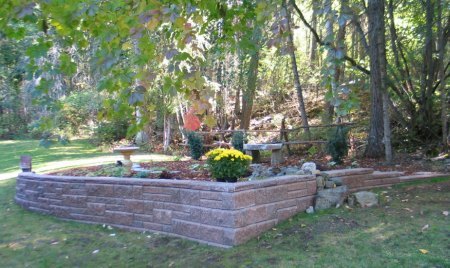 John and his crew installed the wall and created a beautiful planter area for the family. 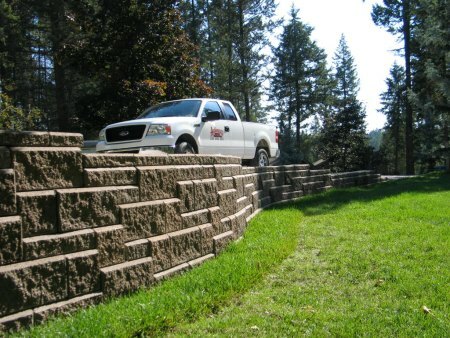 Hard Rock Stone has been an Allan Block Certified Installer for over 3 years. 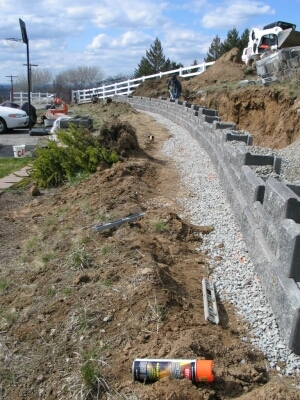 C&C Yard Care needed a retaining wall at their new office building. 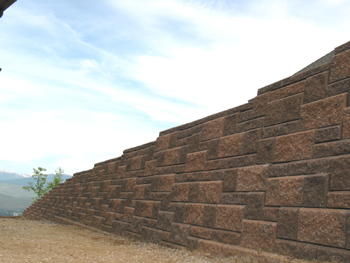 What better way to show product and the quality of their work than to build it with our Allan Block Retaining Wall System in the Ashlar pattern. 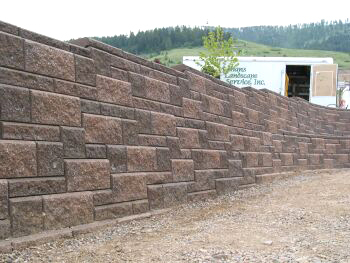 Now he can show clients samples of his crews work as well as the versatility of the Allan Block product line. 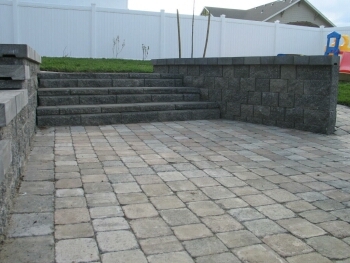 Chris used our Shadow Blend color for the Ashlar pattern. 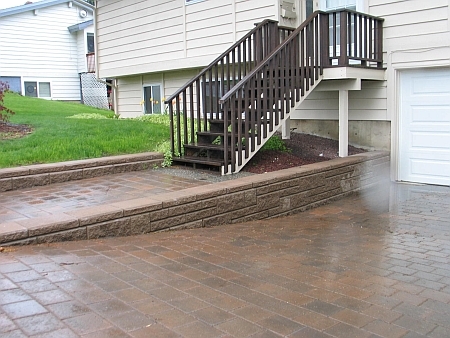 C&C Yard Care has been certified as Allan Block Installers for over 2 years. 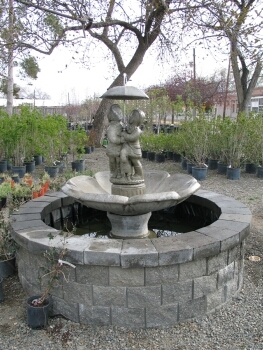 Another good example of the Allan Block Courtyard and its versatility. 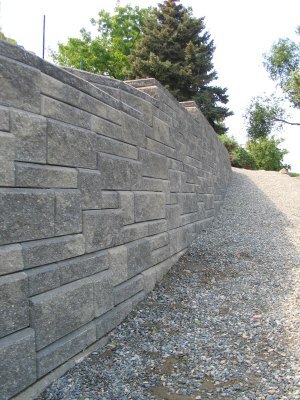 The home owner chose the Allan Block Ashlar Pattern because it is very different from any other walls they had seen. 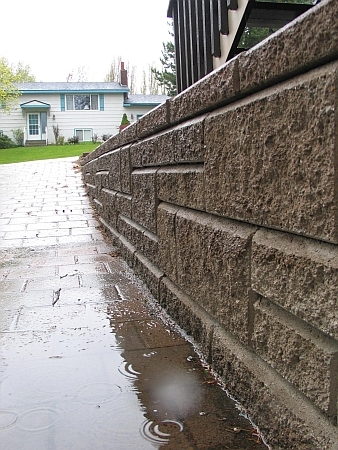 They needed to replace a rotting timber retaining wall and chose the AB Ashlar. 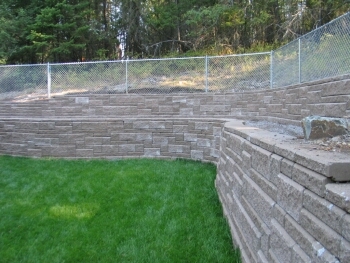 Our Shadow Blend was the color of choice for this project. 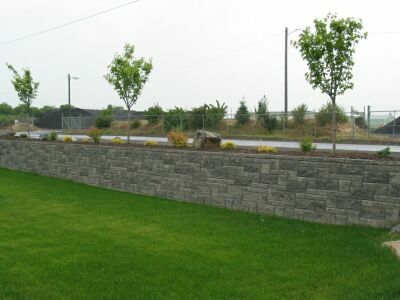 This was a challenging project for Segmwntal Systems. 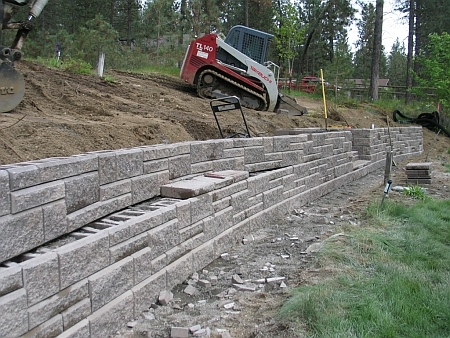 They had to build 2 serpintine walls in the Allan Block Ashlar Pattern. 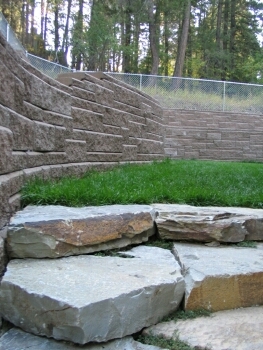 The terraced wall also had to have geo-grid placed every 2 courses. They did a random pattern that breaks up the walls quite well. 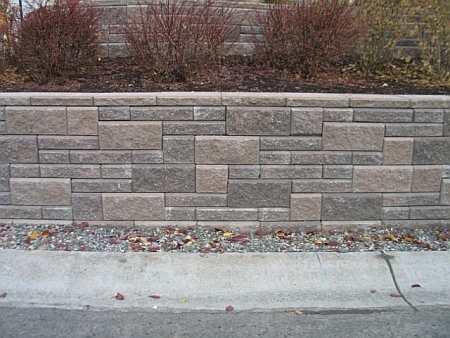 Nice Short Ashlar wall incorporated into the edge of the driveway. 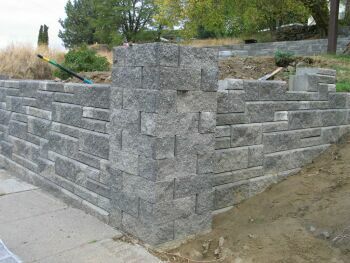 This is the beginning to a great Allan Block Ashlar Wall. 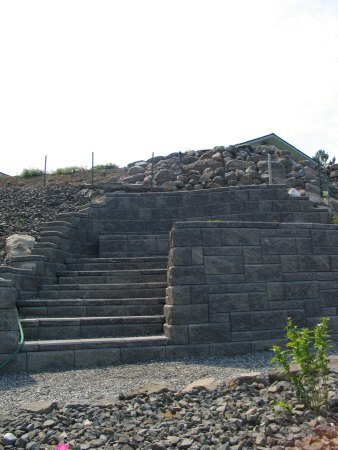 Phase 1 is the lower wall section with the stairs. 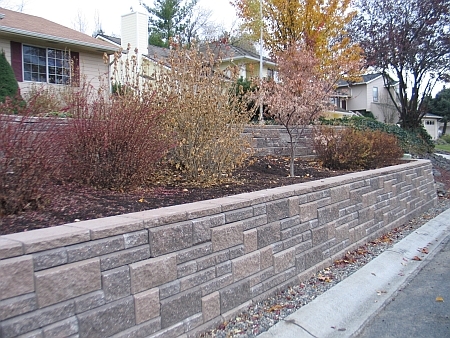 The owners chose our Walnut Blend color to compliment their existing landscape design. 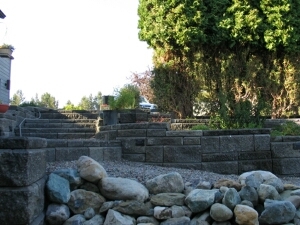 The owners wanted a seating section in the wall which the landscapers accomplished by offsetting the block and curving it back into the wall. 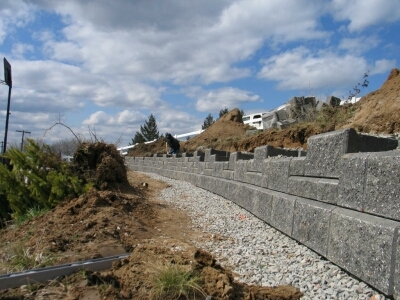 Phase 2 is a upper terraced wall that follows the lower wall. More pictures to follow in 2012! This project was completed earlier this year. It was originally supposed to be a our Redrock Blend color. We had run out of the AB Lites and the new mold parts had not shipped to us. 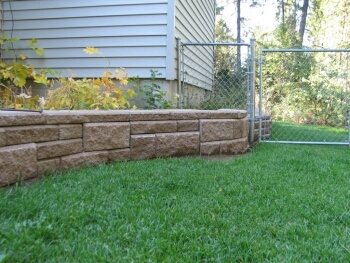 We had just enough components in our Tan color to complete the project. The homeowner was very happy with the tan color. 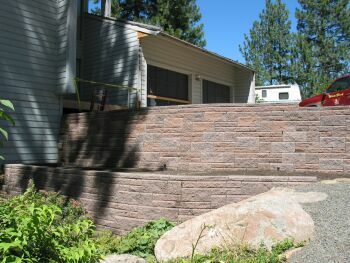 More pictures of the Colton MT project. 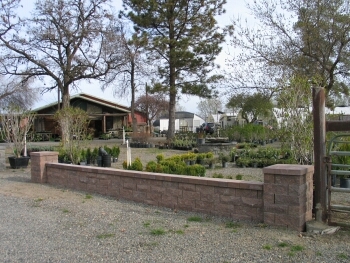 The homeowner need to solve a problem area next to her house. There is a lot of shade and poor drainage which had caused a considerable amount of moss to grow. 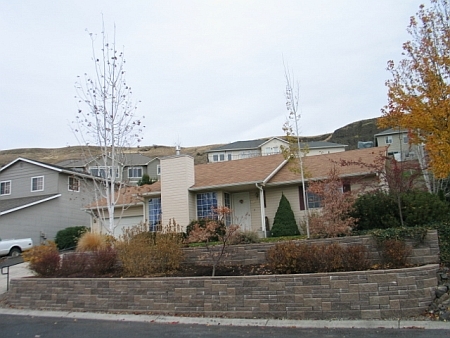 The ground also sloped towards the house. She decided she wanted to grow some shade plants and need to create a raised garden. 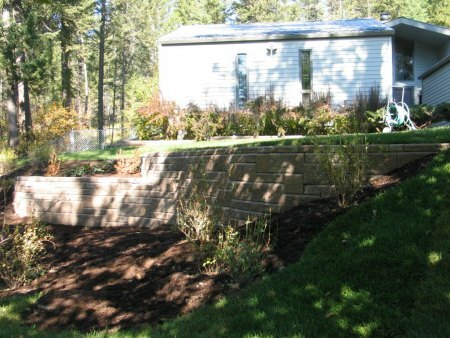 Caleb from Flathead Landscaping designed and created the raised flower bed using our AB Ashlar in the Redrock Blend color. 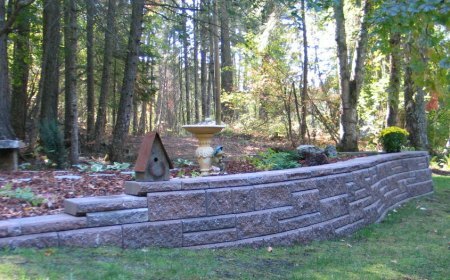 This is phase 2 of a project started in the back yard last year. They needed some support at the driveway to keep it level. 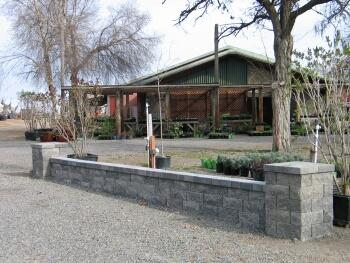 It also provided them with more planter space for their rose bushes. 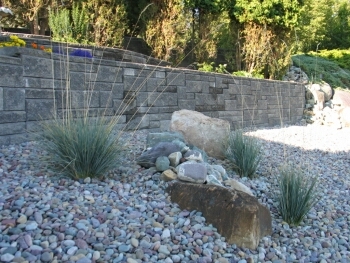 The homeowners wanted to upgrade and add a variety of plants to their landscape. 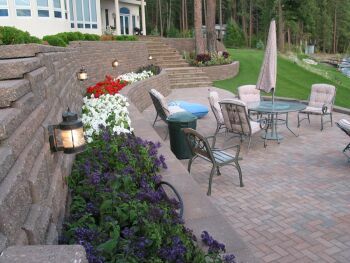 Flathead Landscape created the needed space using our AB Ashlar in the Shadow Blend color. 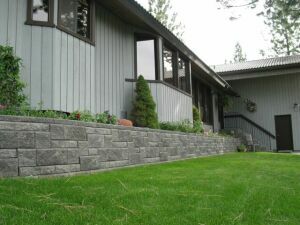 The challange was to replace old failing timber walls with an upgrade in looks and durability. 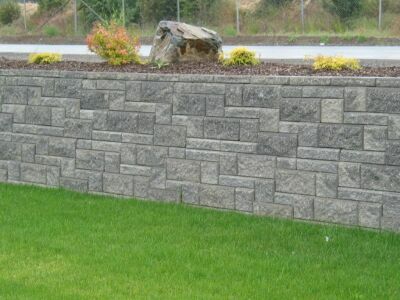 The AB Ashlar in our Walnut Blend color fit the bill. 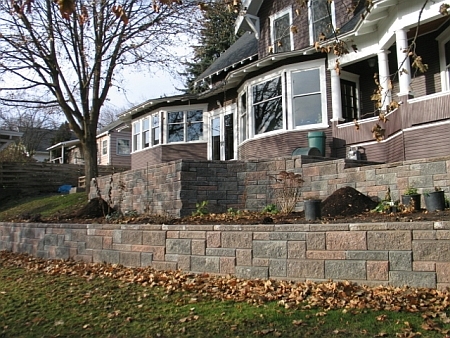 The Homeowners decided to use the Allan Block Ashlar in our Shadow Blend color. 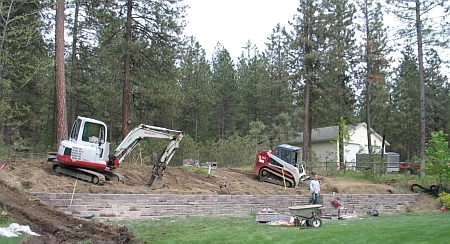 This project is being done in phases that are to include a paver patio and more retaining walls in the backyard. 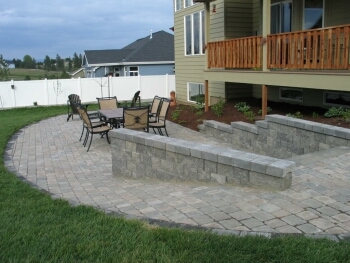 The home owners needed a wall to create a nice patio area for entertaining. They wanted something a little more unique. They chose the AB Ashlar. Then had their contractor install a blend of 3 colors. 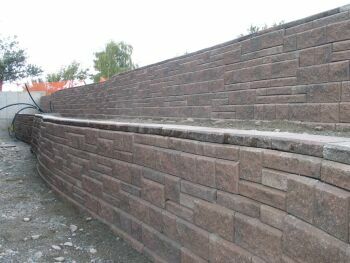 Our Red Rock Blend, Shadow Blend and Walnut Blend colors were all used in a custom blend that the contractor mixed on site. The overall effect is vey complimentary to their home. 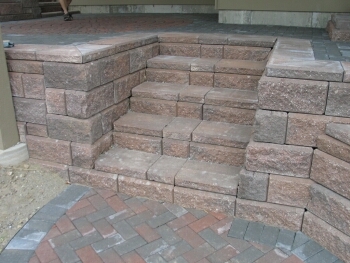 La Vasseur Construction, Inc. used the AB Courtyard System to build in steps and define the stairway area. 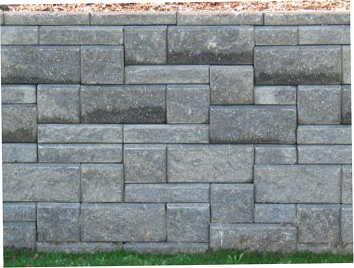 The AB Courtyard is a freestanding mortarless system used to create walls that can define your outdoor living space. 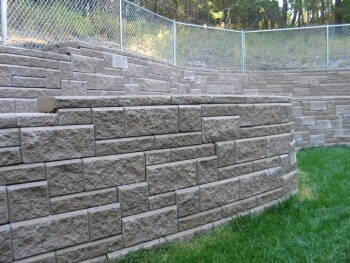 The system is stable enough so you can use it to create extra seating along the top of the wall. 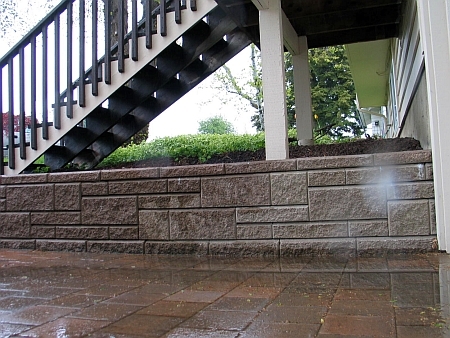 Because its splitface texture is on both sides of the wall, the AB Courtyard System looks great from any angle. 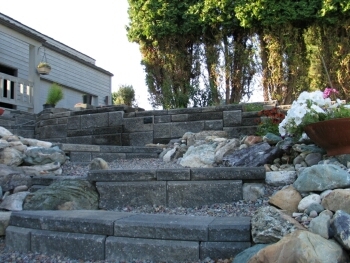 Steve Drown of Abracadabra Landscaping needed to create more patio space for the homeowners. 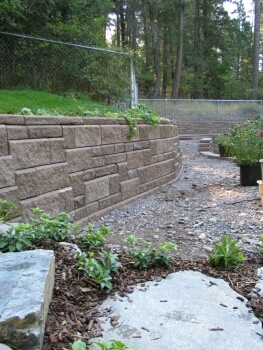 Because of the sloping backyard, he needed to build a retaining wall. 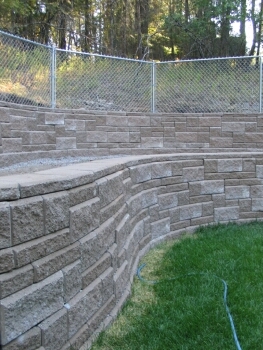 He used the Allan Block Ashlar in our Red Rock Blend color. 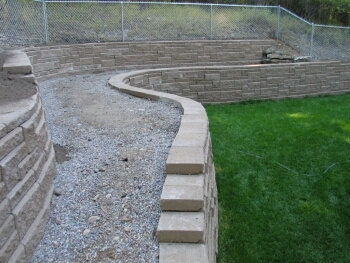 The home owner wanted a nicer look than the regular retaining walls. 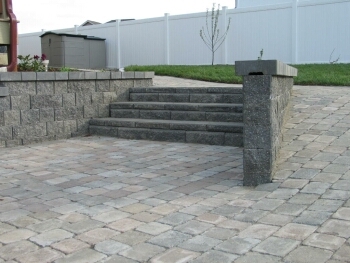 He liked the look of the Allan Block Ashlar System and mixed it up with the post blocks for the Allan Block Courtyard Collection. 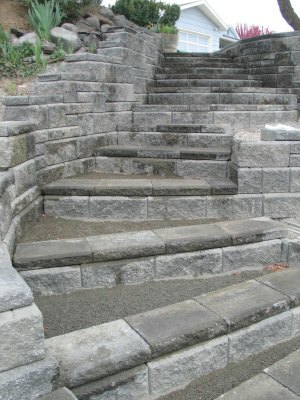 Ian Gordon of Custom Sprinklers and Hardscapes wanted to make this hardscape unique. 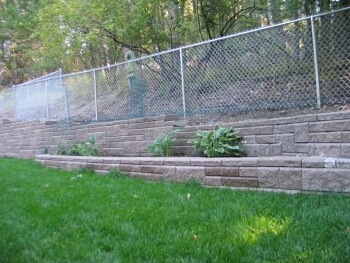 He used the Allan Block Ashlar in our Shadow Blend color to create a beautiful terraced wall. 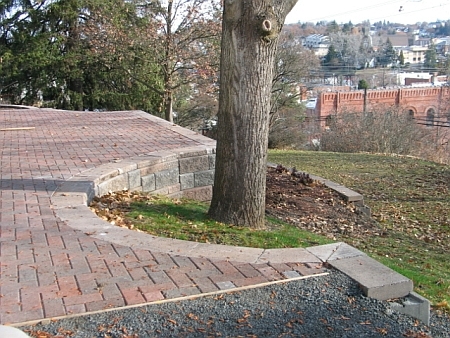 The Allan Block Ashlar was used to replace old wood timbers that had rotted out. 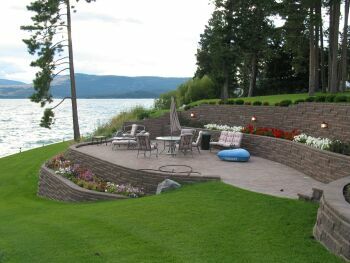 The owners wanted a long lasting product that was going to add some river front appeal to their property. 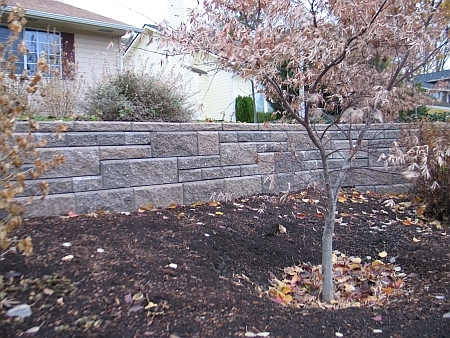 More pictures of the Walnut Blend Ashlar Wall. More pics of this unique color blend. 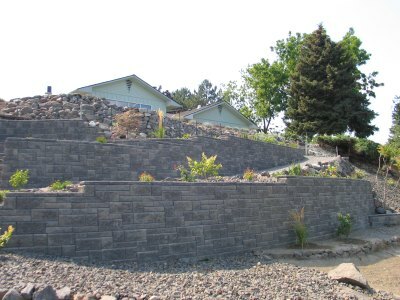 The homeowner needed a retaining wall that has a driveway above it. 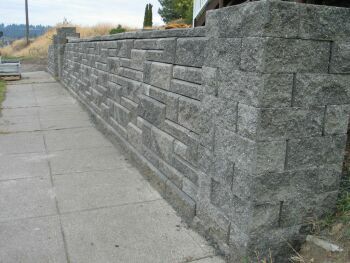 And beacuse the wall is seen from the road, they wanted a more upscale look. 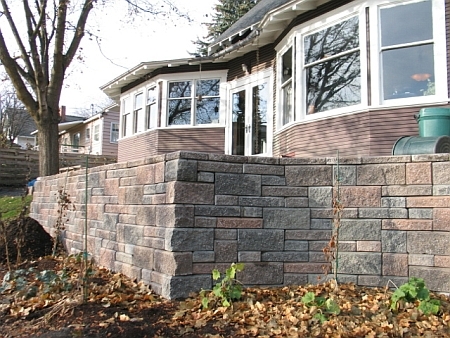 The Allan Block Ashlar pattern was the answer. 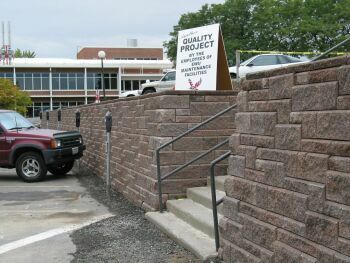 The wall was engineered by Paul Nelson of STI Northwest to accomadate the vehicle loading. 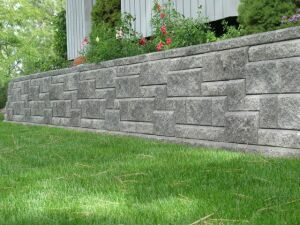 The patterned wall offers a distinct, classic look of cut stone in the wall. 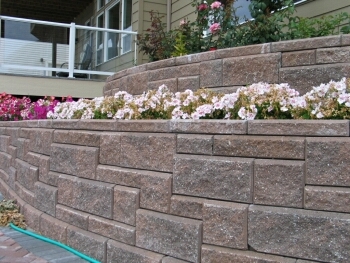 The color used is our Red Rock Blend.